Ah, yes. The sparkly-sparkly always makes us smile. The first votive for my parents is done, and there are three more to go. For this one I used light green, dark green, and pearly (Odessa leftovers) beads. The next one is shaping up to be quite different ;). Do I look like a giant throbbing blister? If I’m not careful, I feel like one! However, I’ve learned to limit my wire knitting to maybe 80-100 sts in any given night, and then I seem to be okay. So, don’t worry, I’m not in pain and doing quite well :). Me: I’m almost done with the first votive sleeve! Me: But I probably won’t be done for a little while, because if I knit too much at once, my shoulders and back hurt. Mom: Yeah… Okay. They are so interesting and different and pretty! I’m not sure I understand your mother’s pause. Wasn’t she concerned about you hurting yourself? Heh. That first picture reminds me of something I said to my husband the other day. We were talking about pain. (I have lots of aches and pains daily.) I told him it’s too bad you can’t just voluntarily light up the spots that are painful right then, because pain is invisible to anyone not suffering from it. When folks totter around doing the best they can in SPITE of pain, other people tend to forget their loved ones are hurting. ooh, what are you wearing in that picture? Most definatly impressed over here!!!! Heh. It’s not easy being green, I hear. The pain is definitely worth it – the votives are gorgeous! Love the sweater in the pictures, by the way. That was too funny! You appear like an image from days gone by when they used to tint all black-and-white photos – only these being the images done by the apprentice. Too funny! Thanks for the laugh! The votives are lovely. I bought wire to knit earrings, but somehow they’re waiting for just the right time when I want to turn those lovely colors of red as well. 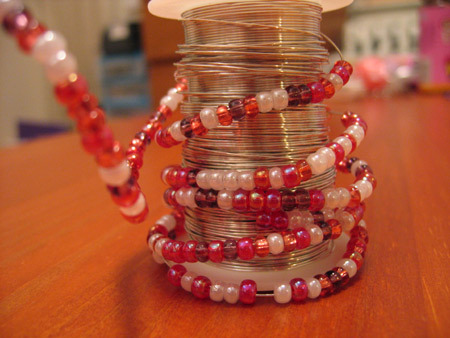 Your always tempting me to go out and buy stuff – now I want wire & beads. Dag nabbit – I got babies to knit for. If the first one is any indication the set is giong to be awesome!! Looks like you *got gauge* in that first votive. (Ha! I crack myself up.) If I adopted you, would you knit some for me? They are delightful! Hi there! My friend Amanda and I are knitting the Shetland Shawl on your recommendation! She is almost done, I have just started. I did your meme in my blog entry today… good idea! Are you crazy? Never, ever, knit (or crochet for that matter) with gauge larger than 26. And I would think very seriously about using 28. Even with 26 gauge, dead-soft sterling, it is pretty hard on one’s hands. 24 gauge would have my arms in slings. I love your votive sleeve #1. But it’s the edited photos of yourself that got the belly laugh. Ho ho ho, you make a lovely green giant. Best of luck to your fingers, back, shoulders, etc. as you lavish love on your parents! You are going to thank yourself when you switch from 24 to 26. Love the new votive sleeve and the colorful photos – you’re hilarious. The votive is so pretty! Where did you get the pattern from? 🙂 the red picture reminds me of ads for done’s pills (?) 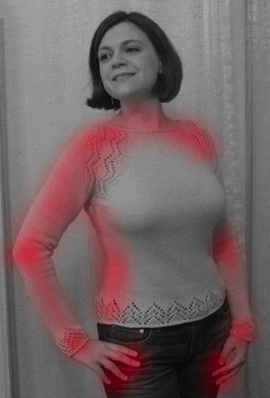 … those crazy commercials that use throbbing red to illustrate the sore spots! i hope the finer gauge wire works out for you, … i eagerly await your review. I think you will like 26 weight much better than 24. For me, it makes a HUGE difference. Love what you’ve with your….uh…color! I’d like to know how the thinner gauge wire works for you. I’ve considered these too and pictures of my fingers flying off was all I could imagine. I did you meme yesterday, it was fun! The votive is really cute. What a great idea! What is the sweater you’re wearing? It is gorgeous! They’re gorgeous, but that wire is pretty darn thick. I can only imagine the pain — I used to do wirework, without knitting, and that was painful. But yay for understanding parents who love what you do! Wow. That’s a courageous endeavor. I love the sweater you’re wearing too! aw, you got spammed. i hate that. i’ve had wire and the pattern for leaf shapped earrings for quite a while. haven’t tried it yet. the votives are lovely but now for the first time i understand people saying why would you knit that when you can buy one at the dollar store? betcha if i try one i’ll understand why ya do! You totally inspired me. How much? Last week I took the book out of the library and made a quick stop at Crate and Barrel for votives. Thanks for the spark. ah, the things we do for love 🙂 my one votive definitely gave me hand cramps… had to spread out the knitting. not sure how that will work for the holiday gifting plan! i did get a spool of 26 gauge though and it seems much easier to use. I can just imagine how ticked off my cat would be if I tried to knit with wire!! 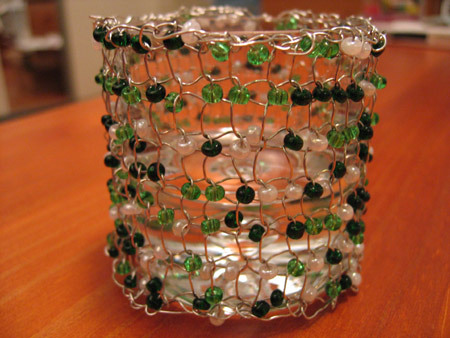 I made 1 beaded napkin ring holder out of 24 gauge wire and my hands were feeling a little raw…i need to invest in some good gloves to do that knid of knitting…. beautiful work on the votive! Honey, get thee to a hot tub! that will make that pesky red area disappear! But the votives looks totally smashing. Uh…can I be a dork and ask you where you got that pattern for the sweater you’re wearing in these pictures? The votives are BEYOOTIFUL! After I saw how pretty yours came out, (much nicer than the ones in the book I mite add), I decided to follow your advice, and get some 26 gauge wire and beads. I LOVED knittting them. It wasn’t as difficult as I thought, but that’s probably the gauge! Still used the sz8 needles, and 8 stitches to cast on. The C&B votive holders are PERFECT for them! A friend of mine suggested making a REALLY big sleeve for almost a hurricane candle holder. That would be nice!! !